When you think that life would need to slow down after a heart bypass surgery, here’s an inspiration story from a fellow Malaysian. Grandpa, David Munusamy Reddie who hails from Nibong Tebal, Penang Malaysia is cycling around the world to see the many places and faces of the world. Not only he had a heart bypass surgery, he also have health ailments- high sugar in urine, high uric acid and high cholesterol. “I started cycling at the age of 51. Not for travel but for exercises. My medical report was bad I have high sugar in urine, high uric acids, high cholesterol and had 3 blocks in my heart. I had cleared 2 blocks by surgery in 2001. My interest in cycling came when I met a Korean cyclist in front of my house in Parit Buntar. He was hungry so I got him something to eat. He told me he cycled from the Thailand border to Parit Buntar (200 kilometers) without food,” says David in his “About Me” page. He packed everything he could carry on his bicycle. 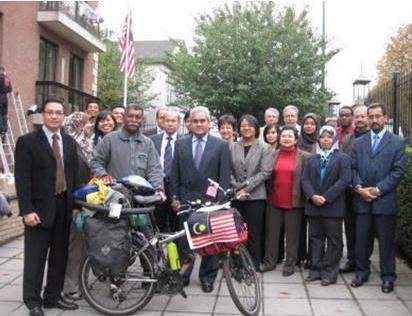 Check out the picture above where he was at the Malaysian embassy in Belgium. To read about his adventures in Europe, visit http://cyclingineuropejuly2009.blogspot.com/. David is really an inspiration- after all, he never let his health conditions stop him. I am sure that due to his highly active lifestyle, his health will improve- even a young man 30 years his junior would find it hard to match his stamina. In many places, he was welcomed by kind hosts who offer him bed and lodging. But there are times he had to camp and stay in the outdoors- such travelling requires not only physical strength but a lot of mental strength- courage, determination and will power. Bicyle tourism is great way to see a country- you will be able to see many sights that is not captured by the lenses of commercial photography. Furthermore, it’s inexpensive and you get to travel light. Possible concerns and issues: safety and the fact that it’s very tough- you will be at mercy of changing weather conditions. Should you decide to embark on your own road adventure, please get a checkup done and get advise from your doctor, especially if you have known health conditions. Even if not, it is good to get yourself vacinated and checked to rule out any silent dangers. Hi David, thanks so much for dropping by- I really find your lifestyle change a motivation. You have been to so many places and taken so many photos- you are truly a great role model for many.